This is a four cheese blend that when melted together tastes like one. So why not just start with one? Just like the provolone reviewed earlier, the two things this cheese has going for it are: it’s cheese and it’s cheap. Let’s take the cheese thing first. Without repeating what was written for the provolone, the ingredients for this cheese include; cultured pasteurized milk, salt and enzymes. That’s what real cheese is made from. Additionally there are some anti-caking agents and a natural mold inhibitor added along with a little artificial color for the cheddar parts. The anti-caking and mold inhibitor are probably added because this is shredded cheese as opposed to slices or a large chunk of cheese. Let’s take the cheap thing second. $2.99 for 12 ounces. When I first saw this, I put the package back in the refrigerator case. $2.99 seemed high for a bag of ordinary cheese. Then I noticed this package contains 12 ounces and not 8 ounces as most cheese packages do. Doing the quick mental math, that’s about $2 for 8 ounces which is about as low as everyday prices are in the current market. Even though this is a four cheese blend, the combined taste is pretty mild and, like the provolone, nondescript. Once again, for $4 per pound we’re not getting gourmet cheeses. But this is no different from similar blends at other stores, which also generally cost a little more. What’s it good for? I use it for a quick “nachos”. Sprinkle some cheese on some tortilla chips. Nuke them for about 30 seconds until the cheese melts. Spread some salsa on the top (I still prefer my salsa). Eat! It should also do well for a quick quesadilla. This entry was posted on 02/16/2012 at 10:10 and is filed under ALDI, Recipes, food, cooking and related items. You can follow any responses to this entry through the RSS 2.0 feed. You can leave a response, or trackback from your own site. 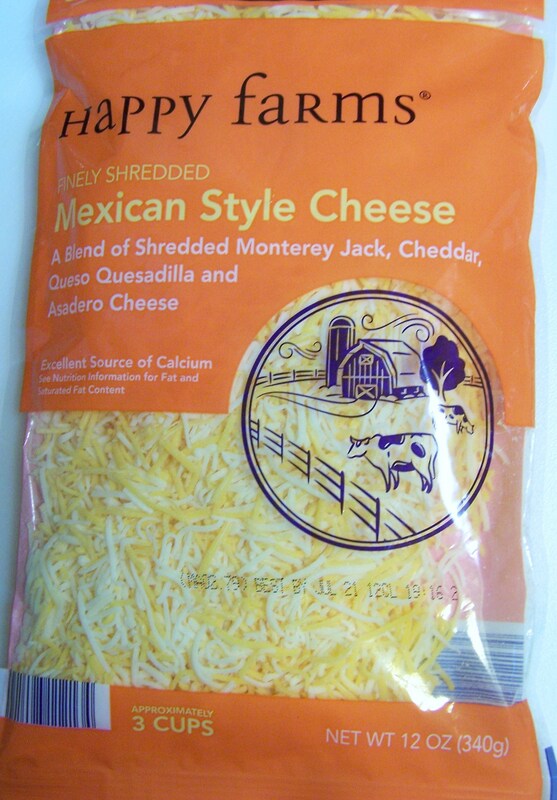 WHERE IS THE HAPPY FARMS CHEESE MADE…OR PACKAGED?